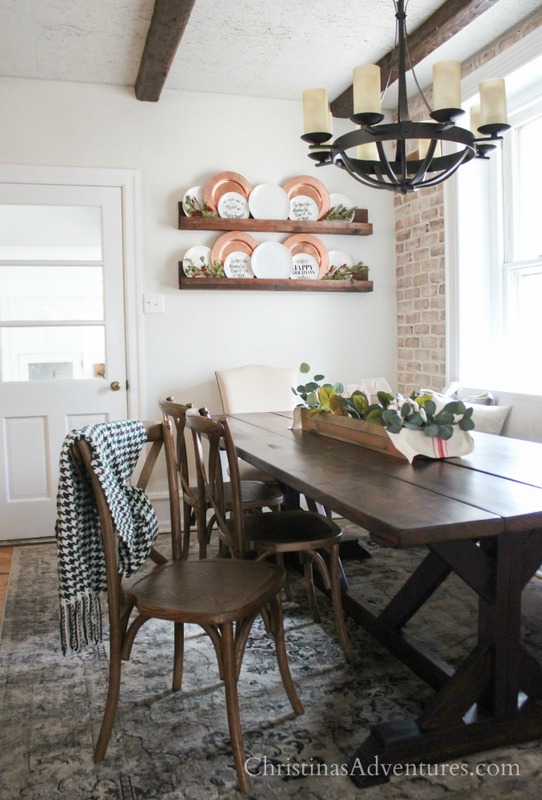 This vintage inspired farmhouse dining room boasts a DIY brick veneer wall, wood farmhouse table, white pew, chandelier, and many more beautiful touches! This post contains affiliate links. Oh friends, it’s done! I finished our vintage inspired farmhouse dining room, and I’m SO in love with how it turned out! I’ve been sharing so many sneak peeks on my Instagram stories, and it’s been so hard for me not to share the whole space! While we didn’t get to everything we intended to do (we never painted the ceiling 🙈 and we didn’t get to do anything to the door.) SOMEDAY I’d love to figure out how to make it into a Dutch door, but it just wasn’t happening during these 6 weeks. Painting the pew & getting a cord cover were simple changes that really helped the whole space come together too. But obviously – the brick wall was our biggest project and it also has the biggest impact. I mean – I’m in love. 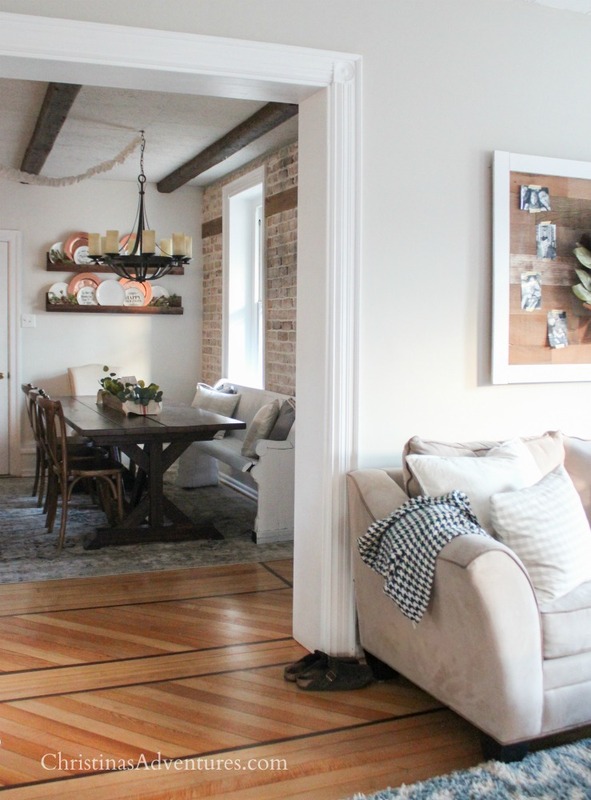 We used the exact same brick as we did in our bathroom makeover. I shared the whole tutorial for how to install it, where to buy it, and how much it cost right here. I am also in love with the wood piece we put in – it’s amazing because it’s functional, but I ended up REALLY loving how it looked. I worried about not being able to hang anything from this brick wall, so we added the wood so we could hang things from it when we wanted. 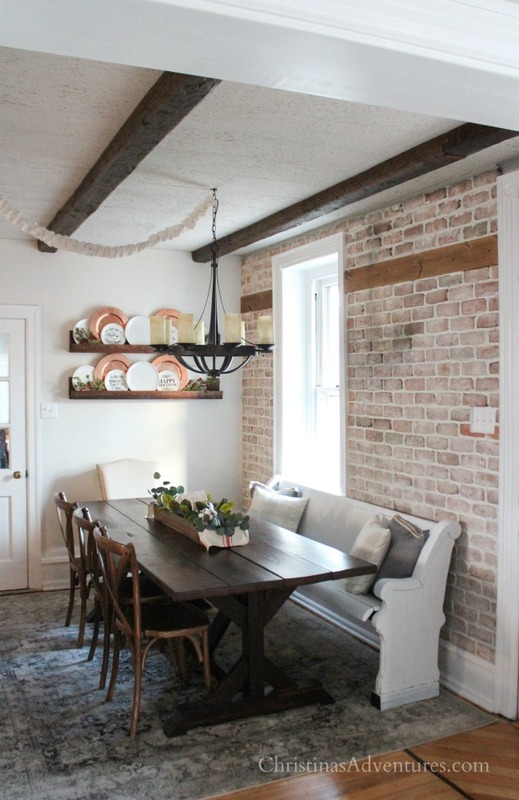 But I love how it contrasts with the brick and brings a vintage feel to the whole space. The fun thing about the brick wall is the fact that it’s SO visible from everywhere in the house. You can see it from almost everywhere in the downstairs – so it really makes such a difference in our home. The only new furniture I purchased were these chairs – they were a great deal and I really really love them! While I was shopping for them, I wrote a whole post about all of my best sources for finding x back farmhouse dining chairs like this one – you can read all about it here. I’ve always been annoyed with this space, and it hasn’t been “quite right” for a few years now. I can finally say I truly love it, and it really has changed the look of our whole home! Beautiful…do you know how long you would have to wait to plaint the brick wall? I am putting up a veneer but want to either white wash it or paint it plain white…haven’t decided yet. Thoughts? So inspiring!! I absolutely love everything about this. I have a similar stuck in the corner type dining area that I have not been able to figure out what to do with. This gives me some great ideas! So pretty!! 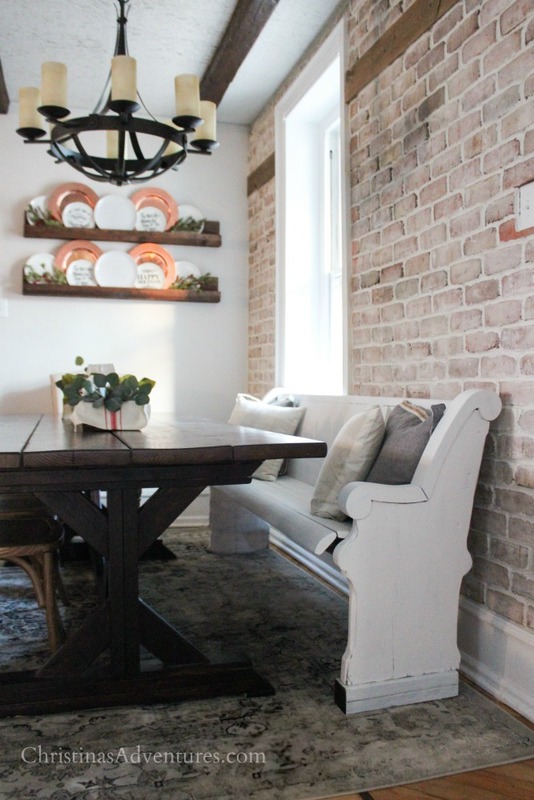 Loving that brick accent wall. So cozy!! I love it!! The brick wall is so beautiful. It makes me want to brick a wall in my home. You did a great job with this space. I just love how your dinning room turned out. So charming! Gorgeous!! I Love X back chairs. Totally farmhouse and lovely! That brick wall is such a beautiful element in the room and you played off it so well. Love that Farmhouse table. The brick wall makes a huge difference! That wall is the perfect wall for brick and I really like that wood detail. Wow, this is nice!! Enjoy! This turned out beautifully, Christina! That brick wall is a stunner! Such a beautiful room. The brick looks amazing. Great job! Oh my gosh, that brick wall is ALLLLLL the heart eyes! Everything goes so perfectly together – such a beautiful space! Such a beautiful space! I am so in love with the brick wall! The brick wall!!! YES PLEASE! 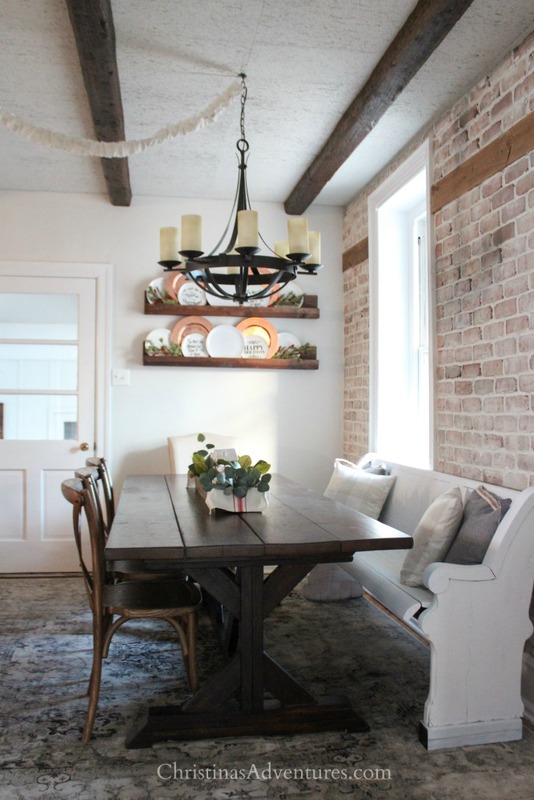 So beautiful, I love the contract of the wood table, white bench and brick wall. Great texture and color combo, dinners here will be so fun! Great Job and enjoy your beautiful space! Oh wow! My jaw is on the floor. I love love love that brick wall and beautiful chandelier! Thank you so much, Julie!! I really appreciate it!! How pretty! The copper plates were SUCH a good choice to bring in more color and warmth. Love it. Simply beautiful! Love the mix of the brick and wood and that church pew bench is genius! Congrats and Cheers to us for another room done! This is so beautiful, my friend! I am in love with that brick wall! You are so incredibly talented and I’m honored to have done this ORC with you! Congrats on a stunning reveal! 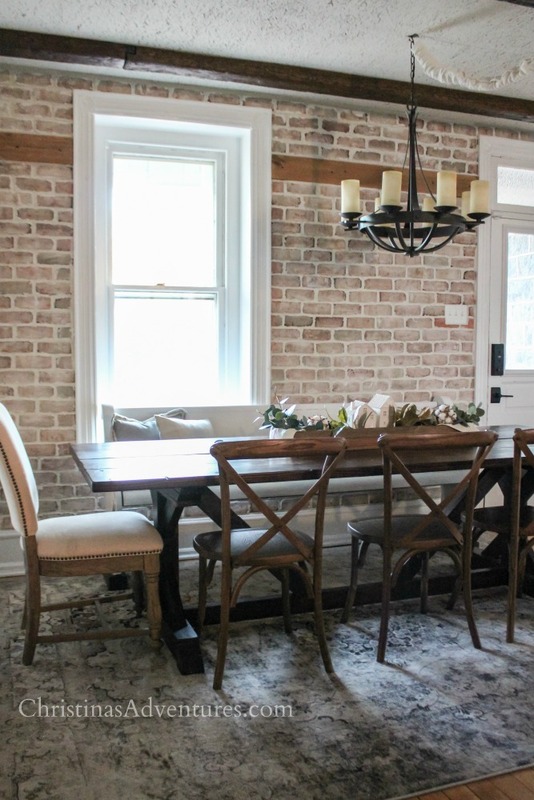 My favorite part is the brick wall, but the whole dining room looks terrific! Great work. It’s gorgeous! That brick wall makes a huge difference. Oh my gosh, it’s so gorgeous!!!!! I absolutely love the brick wall with the wood accent. Everything looks so amazing together and this room definitely has the ‘wow’ factor! Well done. 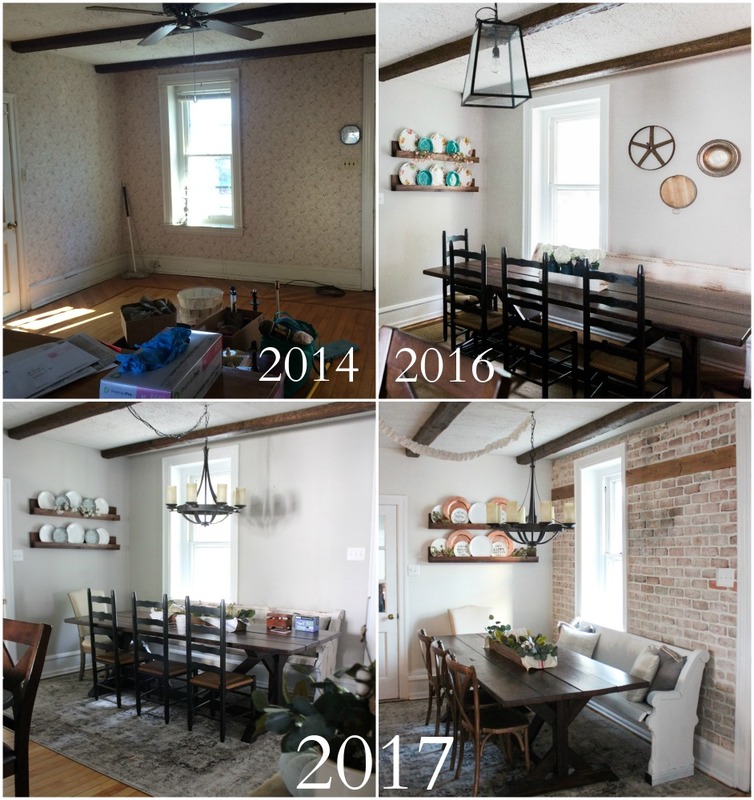 What a beautiful space, and I loved seeing how the room has transformed over time! I am in love with that “brick” wall too – it’s so gorgeous! This is such a beautiful and inviting space! I love the addition of the brick wall. I’ve been toying with the idea for our son’s playroom for a while, and I’m so glad to have your space as inspiration and as an informative source too! Gorgeous makeover! 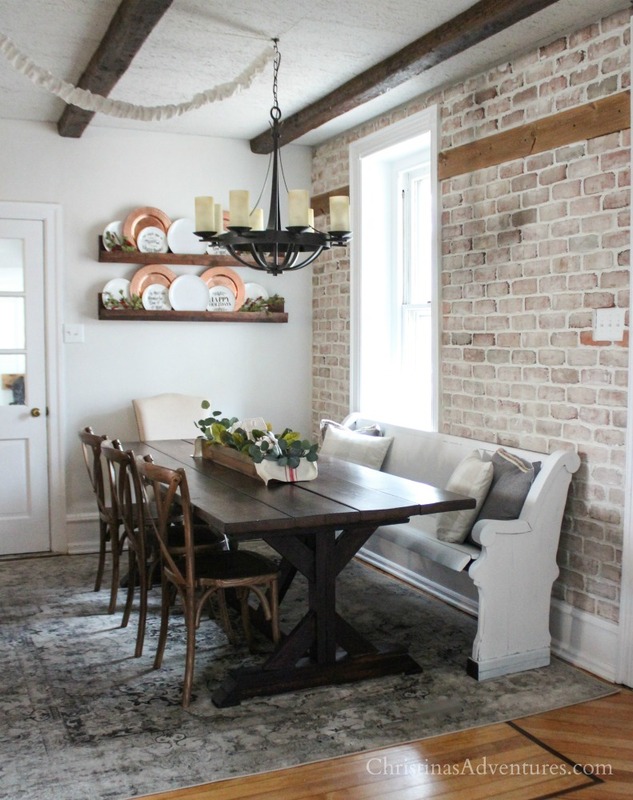 I love the rustic touches and that brick wall looks amazing! Enjoy your new space this holiday season! Hi, where did you purchase the centerpiece?